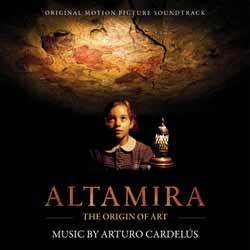 Arturo Cardelús’s score for Altamira: The Origin of Art give us two of the composer's scores. The album contains 18 tracks (34 min, 33 sec) with 12 (24 min, 52 sec) being tracks from Altamira and the remaining 6 tracks (9 min, 41 sec) coming from the soundtrack for the 2016 short Swimming in the Desert. The two compliment each other, but I have to admit I was slightly more a fan of the music for Swimming in the Desert, which is a beautifully laid back affair. Altamira is arguably more complex and varied, so you're getting a lot of variation for your money here. Talking about his work on Altamira, Cardelús said: "While some researchers believe that the paintings are more than 65,000 years old, something about them feels very current. The director, José Luis López Linares, wanted a score that found common ground between the artists' world and ours. The piano ostinato of 'Timeless' and 'Altamira' attempts to evoke the part of us that has remained constant for more than 65,000 years. In addition, we incorporated flutes into the score because they are some of the most ancient instruments. The movie also focuses on Marcelino Sanz Sautuola and his daughter, who discovered the cave while exploring. We decided to go for a warm sound to reflect their relationship. We achieved this principally using soloists over a string orchestra." If you're unfamiliar with the composer's work then this is the prefect way to get aquatinted with an artist who beautifully illustrates here that he is capable of delivering some incredibly moving themes.